"This is a yummy side dish with rice. Using two types of tomato gives the dish texture and is a tasty explosion of flavors with lots of garlic and crushed red pepper." Cover the bottom of a skillet with the olive oil and place over medium heat. Place the garlic, onion, and cayenne pepper in the skillet and stir until fragrant. Stir in the green pepper. Cook and stir until tender, about 5 minutes. Stir in the frozen okra and allow to cook for 5 minutes more. Stir in both the diced and the stewed tomatoes. Season with salt and pepper. Reduce heat to medium-low and simmer until all vegetables are tender, 5 to 7 minutes. 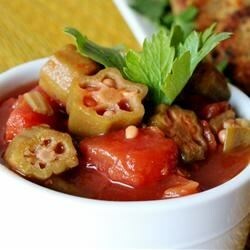 I use fresh okra and add a pinch of sugar to bring out the natural sweetness in the ingredients. I serve with Tobasco and my husband loves it! Great recipe! Very good! I would use 1/2 the cayenne pepper next time - a little too hot for our taste.